This month, many Americans simply think of Labor Day as the holiday which denotes the official end of summer. It is the time when students, teachers, as well as professional staff head back to school and we begin to transition into the fall season. However, Labor Day as a holiday is actually meant for us to celebrate the many contributions of working people to our country. Among the population of workers that are all too often forgotten are the millions of incarcerated people across the United States. Recreated image of the 13th Amendment. Slavery is banned in the United States except for those who are convicted of a crime, thus making slavery legal in some circumstances. Image posted by @JailLawSpeak on Twitter, requesting that the UN recognize the U.S in violation the the UN Declaration of Human Rights, Article 4. Follow them for more updates on the strike. Though there hasn’t been much mainstream news coverage about it, a series of nationwide inmate strikes began on August 21 to protest prison labor, racist sentencing policies, and prison living conditions. The protest was scheduled to last until September 9. As Madison Pauly at Mother Jones writes, it was planned that thousands of inmate protesters would “resist however they could—by refusing to work, turning away meals, or staging sit-ins.” So far, however, it’s proved almost impossible to confirm if the protests are taking place or their impact since corrections officials are remaining quiet and dismissing claims that protests are happening. Still, we know for sure that in North Carolina and Arizona, inmates have engaged in some form of protest. Pauly reports that inmates in the Hyde Correctional Institution in Fairfield, North Carolina, put up banners calling for “better food” and “parole” last week. In Arizona, 18 inmates from Nevada who are being held in a private prison went on a two-day hunger strike to protest solitary confinement, threatening treatment by guards and problems receiving work credits toward early release. There are also reports of inmates staging hunger strikes in California, Washington state, and Alabama. In Florida, it is said that there are between 170 and 210 inmates who are refusing to work. Though prison officials are shutting down communication about the strikes and protest tactics may not be visible, organizers from the Incarcerated Workers Organizing Committee (IWOC) say that thousands of inmates across the country are participating. According to a press release from Jailhouse Lawyers Speak, one of the demands of this strike is an “end to prison slavery” with all detained people in the United States receiving the prevailing state wage for their labor. The issue of prison labor doesn’t receive nearly enough attention and action. We have widespread conversations about workers in this country, mass incarceration and the rights of incarcerated people are left out. We should see all of these issues as interconnected. Recently, we learned that California is using “volunteer” prisoners to fight wildfires—saving the state roughly $80 to $100 million dollars a year. This is not the only example of how states exploit people in prison to do low-wage or unpaid work. States have used prisoners to shovel snow after blizzards, clean up trash and litter in public spaces, as well as manufacture various products, all while paying them anywhere from 14 cents an hour to $2 an hour. This is a point of contention with which we must grapple. Some say that inmates enjoy doing this kind of work because it gets them out of their daily routine and, in some cases, allows them to be outside of the prison walls. There is no doubt that this is likely true. However also, we cannot ignore that prison labor is a form of slavery—since incarcerated people do not have the free will or autonomy to decide if they will work or not. They do these jobs without the protections that other workers across the country are provided by law. Moreover, this labor is the very reason that prisons are able to operate. According to a Newsweek article on inmate labor, Alex Friedmann, Managing Editor at Prison Legal News, says: ”Prisons cannot operate without prison labor. They would simply be unaffordable.” We should make it our business to question a system that relies on locking up millions of people and forcing them to work in order to be viable. Thousands of prisoners are employed by the US government corporation Federal Prison Industries, also known as UNICOR. They make things ranging from office furniture, clothing, and electronics. In 2017, UNICOR sold more than $450 million in goods. The inmates they employed earned, on average, a salary of $1,645. This is not only well below poverty wage, these are also not work skills that inmates can utilize once they are released. According to this survey in 2017, many inmates have few opportunities to continue their education; especially in vocational classes. While 91% of inmates reported that they were employed these skills are rarely transferrable and serve overwhelmingly to the benefit of correctional institutions, not the inmates. Though many of us acknowledge the cruelty of the system of mass incarceration, we have yet to take on prison labor reform as a serious issue. Just like we know its not okay to lock up scores of people (predominately black and brown) for extended sentences for nonviolent crimes, it is also problematic for state, local, as well as private jails and prisons to make money off of these people. The current system is not about rehabilitating the incarcerated but is instead about exploiting them for profit. Sign and send this petition to your representatives demanding basic human rights for inmates using this link. 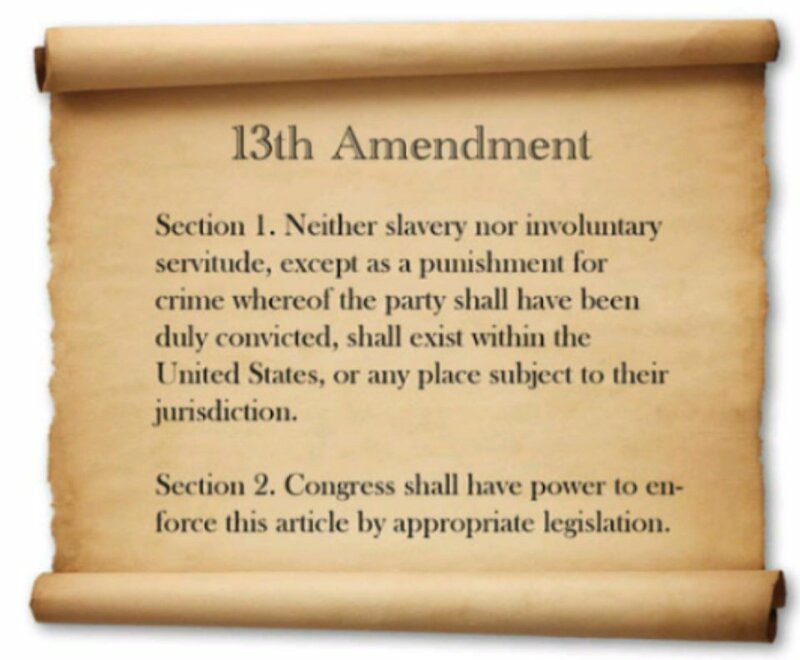 Included snapshot of 13th Amendment for clarity with a description containing a call to action. Included link to Incarcerated Workers Organizing Committee (IWOC) for more information. Included link to Jailhouse Lawyers Speak's social media for more information. Bolded "They do these jobs without the protections that other workers across the country are provided by law. " for emphasis. Turned "It should also be unacceptable to us that private organizations make tremendous profits through prison labor." into a header for emphasis. Added "According to this survey in 2017, many inmates have few opportunities to continue their education; especially in vocational classes." for clarity and the link for more information from The Marshal Project. Bolded "The current system is not about rehabilitating the incarcerated but is instead about exploiting them for profit. " for emphasis. Added call to action and link to the Daily Kos petition for emphasis.